Democratic nominee Hillary Clinton has chosen not have her campaign ads aired on The Weather Channel while Hurricane Matthew hits Florida after receiving backlash from Republicans. The Clinton campaign was allegedly planning on spending $63,000 on a five-day ad buy on The Weather Channel starting on Thursday in battleground states in the path of the storm, according to a Politico report. “Over the past few days, our campaign made millions of dollars of adjustments and refinements to our TV buys on dozens of different cable stations in markets all across the battleground states,” said Clinton campaign spokesman Jesse Ferguson. “The Weather Channel represented less than one percent of that spending. These shifts were part of our regular updates to maximize efficiency, effectiveness and reach of our ad buy,” he added. The move to buy ads had been criticized by Republicans, who accused the Clinton camp of planning to take advantage of a disaster for political gain. The Clinton camp pulled the ads after the criticism. 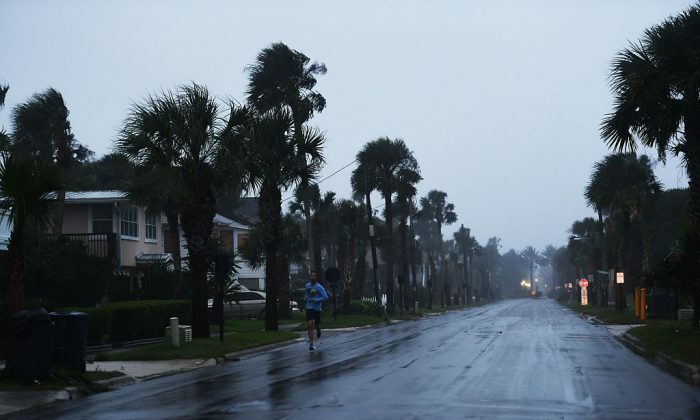 “We have requested that stations in Florida delay any of those ads on the Weather Channel until after the storm passes,” campaign spokesman Jesse Ferguson said in a statement. However, Priebus continued to criticize Clinton on Twitter. Hurricane Matthew is expected to hit Florida on late Thursday or Friday. President Barack Obama issued a state of emergency in the area. “The President today declared an emergency exists in the State of Florida and ordered federal aid to supplement state, tribal, and local response efforts due to the emergency conditions resulting from Hurricane Matthew beginning on October 3, 2016 and continuing,” the White House said in a statement. Both Clinton and Republican nominee Donald Trump advised people to stay safe. “Hurricane #Matthew is a major storm. I urge everyone to follow emergency instructions and evacuate if you’re told to. Stay safe Florida,” said Clinton in a tweet. “Praying for everyone in Florida. Hoping the hurricane dissipates, but in any event, please be careful,” said Trump. Praying for everyone in Florida. Hoping the hurricane dissipates, but in any event, please be careful.